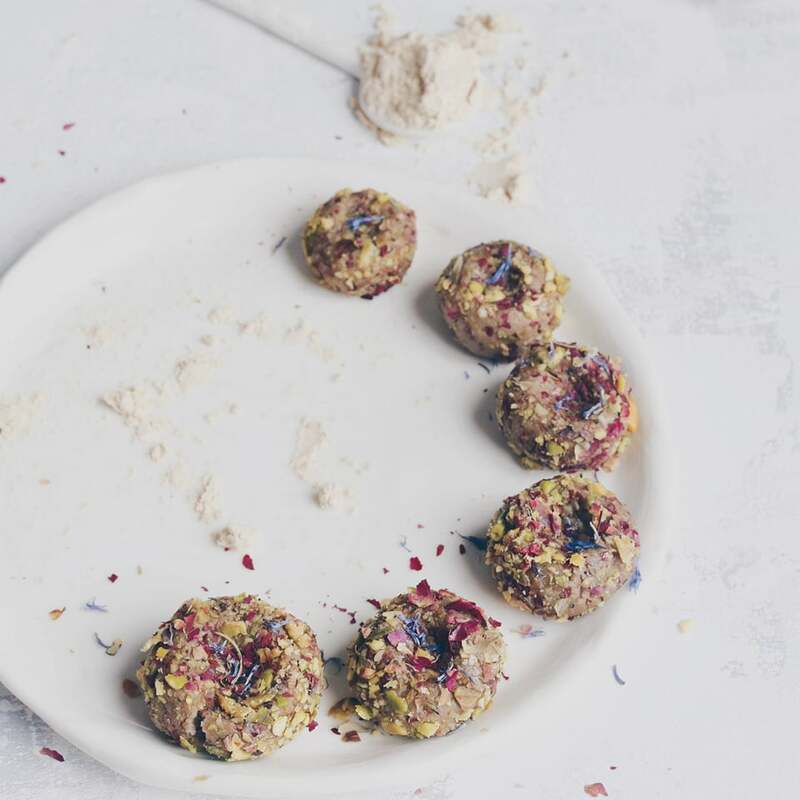 This month I took part in Amy’s Great Cakes Soapworks Mantra Swirl Challenge. If you're not familiar with Amy's Soap Challenge Club, each month she issues a new new challenge or technique to try. 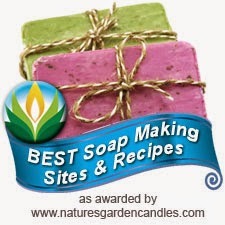 It's a great way to enhance your soapmaking skills and you can join in at any time. When you sign up, you get access to an instructional video for that month's challenge plus written instructions and tips. Members also get to vote on their favorite soaps and there are great prizes involved too! I was looking forward to trying this month's challenge, the Mantra Swirl, as I’ve never done a hanger swirl or mantra swirl before, and I was able to try both of those new techniques in this challenge. 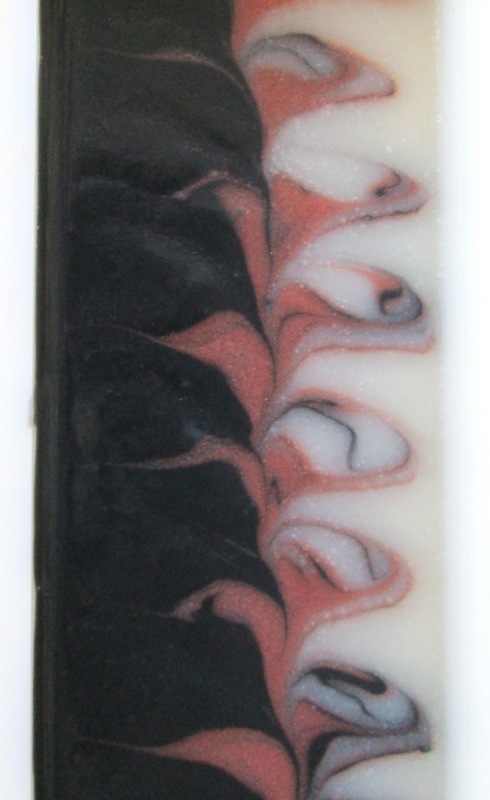 The original mantra swirl was revealed by cutting the loaf into larger bars and then cutting those bars in half horizontally to reveal the surface of the swirl within the slab. 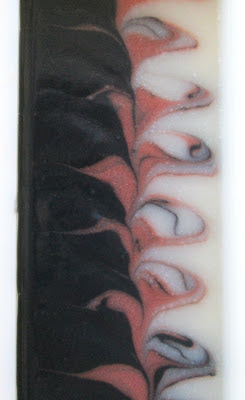 The other option is to do a modified mantra swirl, which is accomplished by combining the hanger swirl technique inside the soap with the mantra swirl on top, and this is the technique I chose to try. All in all, I’m happy with it for a first try, it was a fun technique to tackle...thank you Amy for the helpful instructional video and tips! Beautiful colors! I was going to try charcoal for one of my colors...didn't think about the thickening part, thanks for the heads up. Hoping mine comes out half as beautiful as yours, thanks for sharing. Thank you LC! I'm glad my charcoal experience helped...I'm thinking clays would do the same thing too. Good luck with your soap, can't wait to see what you come up with! Ah, I forgot to take pictures of that part! I did use the super divider mold and it made that part soooo much easier! I've tried the cardboard and just made a mess, I really admire people who can do that! I love this black! How much of AC did you use? I get this black only with smaller portion coloured,with bigger ones it rather looks gray,or greenish. 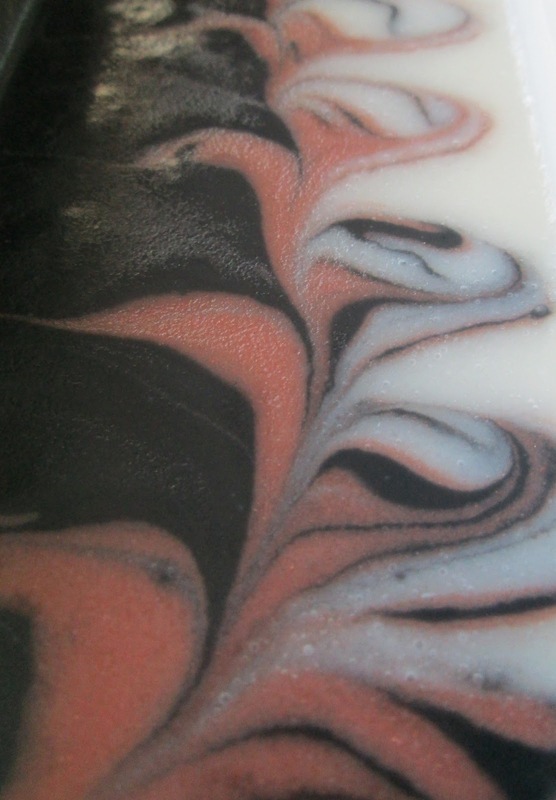 Your soap looks great,Cee and I like you used black& white as a part of colour pattern! 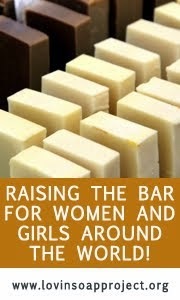 But,your pictures puzzle me: the soap seems to be tall and slim,but on the picture of a single bar, it appears to be vice versa? Thanks Maja...I thought I might have used too much AC, I meant to add it gradually but ended up adding plenty the first time! However, when I tried a piece today it only slightly lathers gray. I'm hoping that the AC will bleed less than black oxide, so far it seems to. I'm not sure why the pictures look different, maybe it's the angle or positioning of the bars? I really like your colors combination, Cee!The top is just perfect and the swirl is beautiful, Cee! Nice try! I made soap yesterday, I will cut it tonight, I hope this is my last try! Thanks Natalia! I can't wait to see yours, and you're right...this soap technique was definitely challenging! Beautiful mantra swirl, Cee Gee! I haven't tried that technique yet, but it's on my list! Thanks Jenny, I'm still intimidated by this one...I need to practice a bit more! I hope you get a chance to try it! A mi me parece un trabajo bien hecho, además es lo que tiene el jabón artesano, que siempre nos sorprende. Hi Kalla, thanks! This was definitely a challenging technique, I may tackle it again too if I'm feeling brave enough! Thank you Gordana, I hope you get a chance to try it! I love your soap! The swirls make me think of vanilla ice cream covered with dark chocolate and strawberry sauce. I love your color combo on this, great job. Nice color combo! I used charcoal for my middle color and I could definitely feel the thickness there when swirling. I like the colors and the "picture" from your swirls. So pretty! Your white is so nice and white! Love it!